Hi, I’m back to work! It has been a long hot summer on the playground.. but while I was doing Mommy stuff others have been busy. 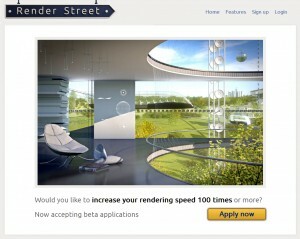 I’m proudly presenting Render Street, an online farm project I’m part of. The other part is my husband Sorin and his partner Marius. From his desk positioned next to mine in our home, Sorin has watched me struggle several times, trying to use a couple of online render services to be able to finish projects on schedule. While I was mumbling annoyed words about uploading being a mess and render times too slow he said “wait, we could easily do something like this that would work!”. I tripped over a nasty messy stuff on this new project I’m working on. I’m setting up an aerial view of an urban proposal and have some simple geometry with lots of instancing. Inspired by some cool tutorials on postporcessing archviz illustration styles, I tried my hand at using Blender’s Compositor for creating this type of image. 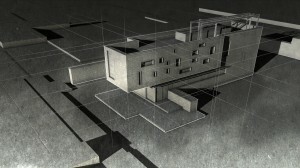 The original tutorial used Sketchup+Photoshop and this I think would be easy to recreate with Blender+ps or Gimp, but I took the challenge to mix it all in the Compositor. This is not directly archviz related, doesen’t even come with a nice image, but found it a great time saver so thought I’d share. The project I’m working right now presented a special challenge: I got 21 blender files to edit and render separately (it’s a presentation of elevator interiors, with many variations I could not help but making separate files). Yesterday I was really caught with having to prepare in a hurry a whole set of drafts and I hoped I will be able to do a batch render of all the 21 files so I started googling the way to do it. However, setting the Best Quality bump mapping for a material that gets reflected results in weird artifacts in the reflected image.